I'm so excited about these! 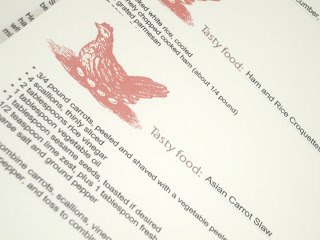 I just finished updating the PDF templates in my etsy shop to be editable. So now, rather than printing generic paper goods, they can be personalized, customized or easier to fill in. 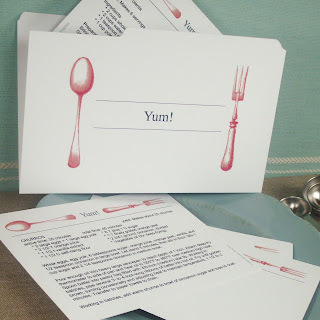 With the editable Recipe Cards you can type your recipe right into the PDF or copy/paste recipes from the web and print. No More Handwriting!! You can edit the recipe in the PDF too. Add your own notes or substitutions. Of course, you can still print them blank to use or give. 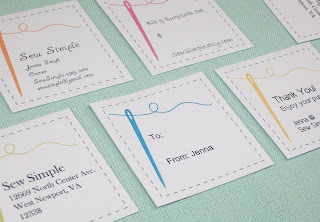 These 2" square tags/labels I created with the hobbyist or etsy shop owner in mind, but they could be handy for anyone (personal calling cards or address labels). They come blank and the text can be formatted in MS Word or such and pasted into the PDF. 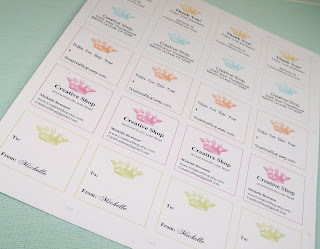 The above Crown tags all came from one sheet. 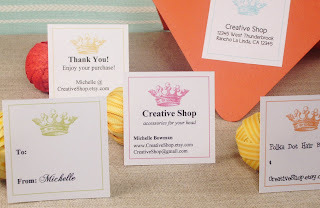 Print them on cardstock or label paper. So MANY possibilities! I'll share new designs as I create them. A BIG THANK YOU to those who were kind enough to do the testing for this process. I really appreciate it! These are wonderful! Thank you for creating these! Whitney - you use such great graphics! Your designs always make me smile! I am playing around with a spoon/fork/knife design now and I wondered if I was crazy! Bu I see how cute it can be! I am going to purchase come of your folder designs - they are so cute and could really come in handy these days! PSS - thanks for your thoughts on printing. I get my printer hooked up tomorrow, we'll see what kind of magic it can do? ANd I did find a couple of local resources! yeah!